THIS PICTURE MAKES IT ABUNDANTLY CLEAR why at this period Gauguin still considered himself an Impressionist. It is painted in divided brush strokes, and barely makes use of outline for certain striking forms such as the pigs in the foreground and the houses behind. Space is depicted, but the reced¬ing and overlapping planes fuse into one another without that clearcut sense of interval so characteristic of Cezanne. Indeed the whole left-hand side of the picture might at first glance be by an Impressionist, especially the foreground field. Only the colors - the juxtaposed purples and pinks and mauves - so typical of Gauguin, seem to suggest the style of the future. 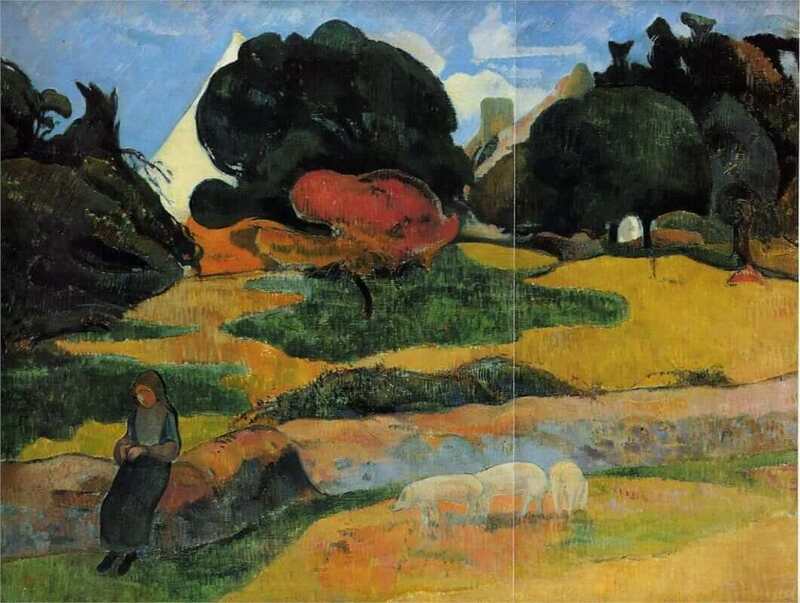 And yet a second look reveals the continuous curved areas of the later Gauguin; their outlines are still ragged and, so to speak, unkempt; but they are there in the passage above the cow on the left, for example, or the fields to the right of the swineherd, indicating that Gauguin's sense of organization will demand a tighter principle of composition than the suffused light-and-color of Monet and Renoir. Then too this is a genre picture, painted with sympathy (and perhaps envy?) for the monotonous simplicity of a peasant life apparently without problems. "I love Brittany," wrote Gauguin to his friend Schuffenecker. "I find wildness and primitiveness there. When my wooden shoes ring on this granite, I hear the muffled, dull, powerful tone I seek in my painting."